This site was designed for people who collect items related to the works of J. R. R. Tolkien. These include books, posters, calendars, postcards, t-shirts, figurines, audiotapes, chess sets and a host of other items. It is apparent that many people have been inspired by Tolkien's creations and this has resulted in a great interest in collecting things related to Middle-Earth. Virtually everyone who has an interest in the stories has become a collector of sorts, if only to buy a calendar each year. Unfortunately, it has been difficult to find material. Before the internet, most collectors found things by accident - they noticed an item at a flea market or happen to find something in Uncle Bob's attic, up there with the denim jacket and the Zap comics. Until recently, there were no general sources for items and limited information about collecting. 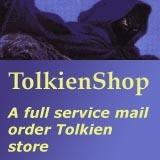 This is where the internet and tolkiencollector.com comes into the story. It is clear that this type of collecting would greatly benefit from a central store of knowledge and lore concerning Tolkien material. Although this site contains a significant amount of information, it is not exhaustive. That is where you come in. In contrast to printed sources of information, this page is a living resource that is constantly updated. As I get information from collectors and other sources, the database grows and I periodically regenerate the web site. If you know of a source for collectibles that I have not covered, or have some details about collectible items that you think others should know, please send me e-mail and I will add this information to the site. In this way, we can have the most elaborate and current knowledge base on which to build our collections. At this point in development, I focused on resources, rather than a detailed listing. In addition, although there are numerous pamphlets, dissertations, conference posters and a host of other material on Tolkien, I have focused on the material that collectors can now reasonably expect to find and acquire. Finally, I have naturally focused on Internet resources. If a publisher, dealer or an individual with an item for sale has an e-mail or Web address, it was likely included here.